Phoenix Solutions Plasma Heating Systems are used extensively in Japan and Asia. PSC systems meet or exceed all Japanese safety and industrial standards. Phoenix Solutions Co is the world leader in supplying Plasma Heating Systems for ash melting applications. Plasma is used to melt residual fly ash and bottom ash from waste incinerator plants. The result is a non-leachable glassy slag that can be recycled as road aggregate. PSC Ash Melting customers include Ebara Corp, K-Plant, JFE, Kurimoto, BHK and Kobe. EBARA Corp utilizes PSC Plasma Technology in their Plasma Ash Melting Systems, with five facilities across Japan processing a total of over 270 tons of waste per day. Phoenix Solutions Co is a leader in Plasma Tundish Heating systems worldwide. Our plasma torches are used for precise temperature control in continuous casting applications. PSC Tundish Heating customers include BaoSteel, Daido Steel and Nippon Steel. Nippon Steel Corporation utilizes PSC Plasma Technology in their Twin-Type Tundish Plasma Heater for continuous casting of steel. Phoenix Solutions Co recently extended our experience base to silicon processing for solar power applications. PSC Solar Silicon customers include SUMCO and UMK. Phoenix Solutions Co Plasma Heating Technology is used to treat hazardous or toxic wastes. PSC Plasma Technology is used by Kobelco Eco-Solutions in the treatment of harmful PCBs and the volume reduction of low-level nuclear waste. Kobelco Eco-Solutions Co., LTD utilizes PSC Plasma Heating Technology in their Kitakyushu facility to treat harmful polychlorinated biphenyls (PCBs). Plasma destroys the hazardous contaminants in hard-to-treat solid PCB waste. In their Tokai facility, KES employs PSC Plasma Technology during de-commissioning to reduce the volume of radioactive waste sent to storage. 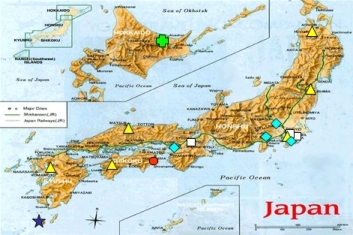 Locations of PSC Plasma Heating Systems in Japan.